The Wheaten was originally bred in native Ireland to be an all-purpose farm dog whose duties would have included herding, watching and guarding livestock, and vermin hunting. This is probably why they are not as aggressive as other terriers, who were primarily vermin hunters. They are believed to be related to the Kerry Blue Terrier. Despite its long history, the Wheaten wasn’t recognized as a breed in Ireland by the Irish Kennel Club until 1937. Following this in 1943, the English Kennel Club recognized the breed as well. The first Wheatens were exported to the United States in the 1946, but serious interest in the breed took years to develop. 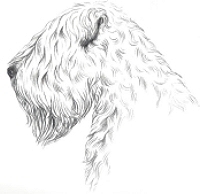 Lydia Vogels was one of the first breeders of the Wheaten Terrier in the United States. Finally, in 1973, they were recognized by the American Kennel Club. The Soft-Coated Wheaten Terrier is a medium-sized dog, which ranges on average anywhere from 17 to 19 inches and weighs about 30 to 45 pounds. The breed seems to have a square structure and is well built. Its hair does not shed like most dogs; like human hair and Poodle hair, it keeps growing, needs regular trimming, and drops just a few hairs daily. The Irish coat tends to be thinner and silkier than the English and American varietys. A curiosity of the breed is that whenever an adult wheaten incurs an injury to the skin the resulting coat will grow out in the puppy brown color and then return to Wheat over time. Puppies have a dark coat of either red, brown, mahogany or white. The muzzle and ears of Wheaten puppies may be black or dark brown. The dark puppy coat gradually grows out into a wheat-colored white brownish coat as they get older. The color can range from wheat to white, but white coats are not considered desirable by breeders and show enthusiasts. 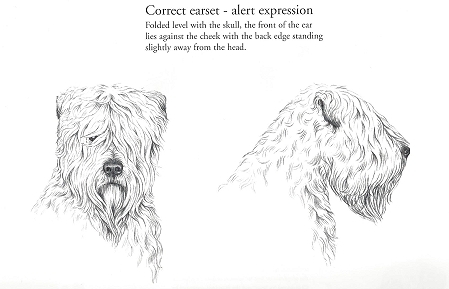 The adult coat may contain black, white, or darker brown "guard" hairs in addition to the lighter wheaten-coloured hair. Please contact Mr Watkins if you would like to adopt a wheaten in need or if you have a wheaten you need help with rehoming. You can find further information on www.wheaten.org.uk under Owning a Wheaten.